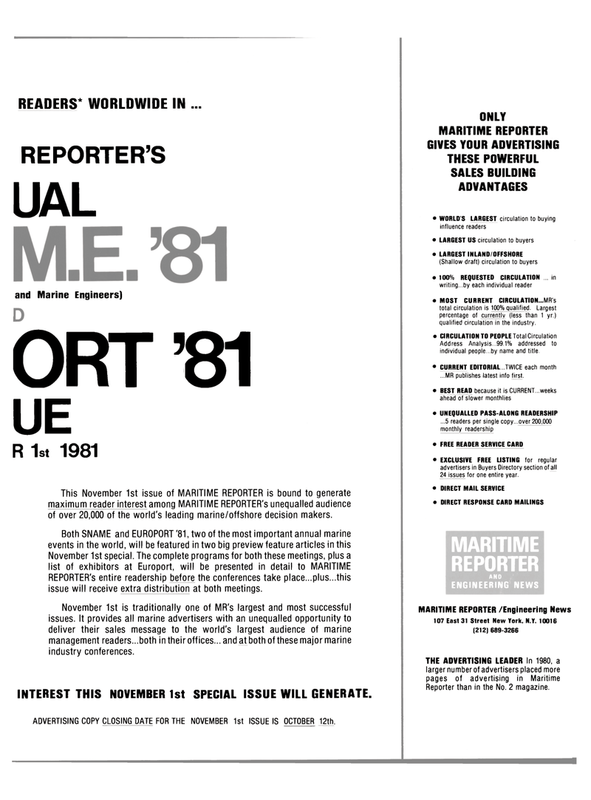 This November 1st issue of MARITIME REPORTER is bound to generate maximum reader interest among MARITIME REPORTER'S unequalled audience of over 20,000 of the world's leading marine/offshore decision makers. REPORTER'S entire readership before the conferences take place...plus...this issue will receive extra distribution at both meetings. November 1st is traditionally one of MR's largest and most successful issues. It provides all marine advertisers with an unequalled opportunity to deliver their sales message to the world's largest audience of marine management readers...both in their offices... and at both of these major marine industry conferences. INTEREST THIS NOVEMBER 1st SPECIAL ISSUE WILL GENERATE. ADVERTISING COPY CLOSING DATE FOR THE NOVEMBER 1st ISSUE IS OCTOBER 12th.